Hamletmaschine is a multimedia installation from 2008/09. 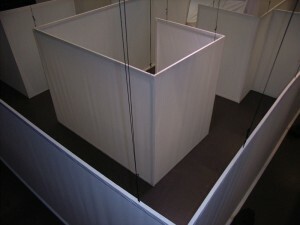 The text „Die Hamletmaschine“ from the german author Heiner Müller is translated into a big, maze-alike room installation made from wood, lighting and white fabric. The visitors walk into this installation and listen to a five-channel sound composition made from field sounds, a text performance by a female speaker. They can experience two video-installations, too. The choreographies shown in the videos are based on prints from the Totentanz. The field recordings are from social and cultural places and spaces, which are related to the topic of death.